“Everything starts with who we are, not what we do, … the curiosity, creativity, the composure, the drive” reflects Dr. Craig R. Smith, of New York –Presbyterian Hospital/Columbia University Medical Center. True to his words, although Dr. Smith is revered as a technical master and respected academician, it is his calm, gracious and unassuming manner for which he is equally known and appreciated. Craig Richey Smith, Jr., was born in Cleveland, Ohio, on November 17, 1948 as the second of four children. Smith spent much of his childhood on the move, where he learned to adapt to change. His role models were his grandparents, both of whom were doctors. His grandfather instilled in him the energy, love, and passion for patient care and hard work. His grandmother introduced Smith and his brother to the outdoors, teaching them the art of fly-fishing and horseback riding. In high school Smith excelled at football, playing quarterback, running back, and safety. He also was accomplished at lacrosse, wrestling, and the long-jump. Although considered a lackluster student, he was accepted to Williams College, where he excelled and graduated Phi Beta Kappa. A summer injury in a steel mill ended his collegiate athletic career. During his final years at Williams, Smith was influenced by genetics professor who taught him the value of basic science and solid experimental design. He began a graduate program at Dartmouth College, but dropped out after his second year to spend the next 14 months as a telephone lineman. After his stint as a toughened laborer, Smith was finally accepted into medical school at Case Western Reserve in Cleveland in 1974. After medical school, he went to the University of Rochester Strong Memorial Hospital for his internship, residency, chief residency in general surgery, and fellowship in vascular surgery. Then, it was on to Columbia Presbyterian for his cardiothoracic surgery residency. Smith recalls the program there to be physically grueling but clinically rewarding. After completion of his cardiothoracic surgery training he was recruited to join the Columbia faculty. In 1996 he became Chief of Cardiothoracic Surgery, and in 2007 he was promoted to Chairman of the Department of Surgery. During his tenure at Columbia, Smith has trained more than 35 general surgery residents and 43 cardiothoracic surgery residents and has co-authored more than 175 publications in peer-reviewed journals on topics of transplantation, coronary revascularization, and valve surgery. Dr. Smith's clinical specialties include medical support for pre- and postoperative transplant recipients, use of bioartificial liver support devices, and alternative immunosuppressive strategies. 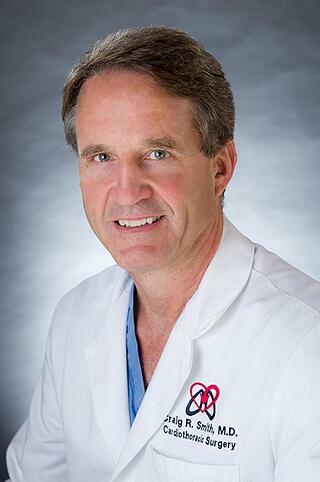 His research interests focus on mitral valve repair, transmyocardial laser revascularization, long-term heart and lung transplantation outcomes, preoperative risk factors for stroke after CABG, and adaptation in cardiac transplantation and was the surgical principal investigator of the landmark Placement of Aortic Transcatheter Valve Trial (PARTNER) that demonstrated the safety of transcatheter aortic valve replacement.